Shelly Manne’s extensive career encompassed every facet a musician could aspire to achieve. Born into a musical family, he began drumming at age 17 in New York, ultimately performing with top-name big bands and small jazz combos comprised of many legendary jazz and classical artists. After moving to California, he established himself as a first-call musician for the major television and movie studios, where he recorded hundreds of TV and film scores, including several of which he composed. When Shelly was young, his father, Max Manne, also a famous drummer, was a manager at the Roxy and Radio City Music Hall theatres, where Billy Gladstone, the snare drummer for Radio City Music Hall, was a close family friend. Therefore, Gladstone was the logical choice as Shelly’s teacher, mentoring Shelly as a student and assisting him in acquiring drums for his first professional position. 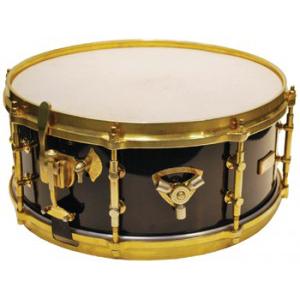 When Gladstone began to manufacture snare drums, Shelly was one of the first to receive one. 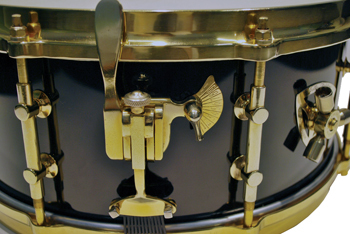 Gladstone built about 50 snare drums, many of which no longer exist. Shelly’s drumA hollow cylindrical shell of any size that has a head stretched over one or both ends and is b... is labeled “No. 1.” However, Gladstone had also begun to work on a second drum for the New York Philharmonic’s snare drummer, Buster Bailey. 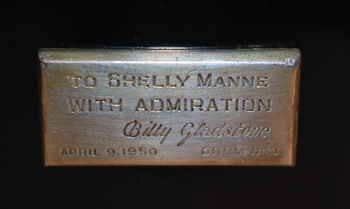 As it was completed before Shelly’s drum, Gladstone affixed the label “Drum #0” on the Bailey drum, which is currently on loan to the PASThe Percussive Arts Society is a music service organization whose mission is to inspire, educa... More museum collection. 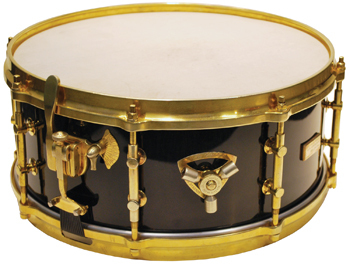 Shelly’s 8-lug drum is constructed from a 6 x 14-inch, three-ply, wooden Gretsch shellThe cylindrical body of the drum, usually made from plywood., finished in black lacquer, with no interior reinforcement rings. 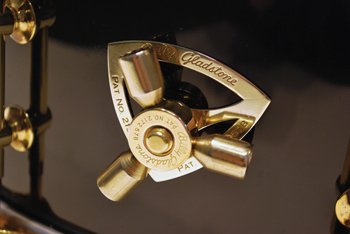 The hardware is gold plated, making this the only Gladstone drum in this color combination.